Are also called “The home of betting” but the name is William Hill and they offer a Free £25 bonus for new customers, that can be claimed by creating a new account on their official website and during the registration process the new client has to enter the promo code F25, this way, when the customer places his first bet with a minimum £5 deposit he will recieve a free bet with the same value of his first bet up to a maximum of £25. 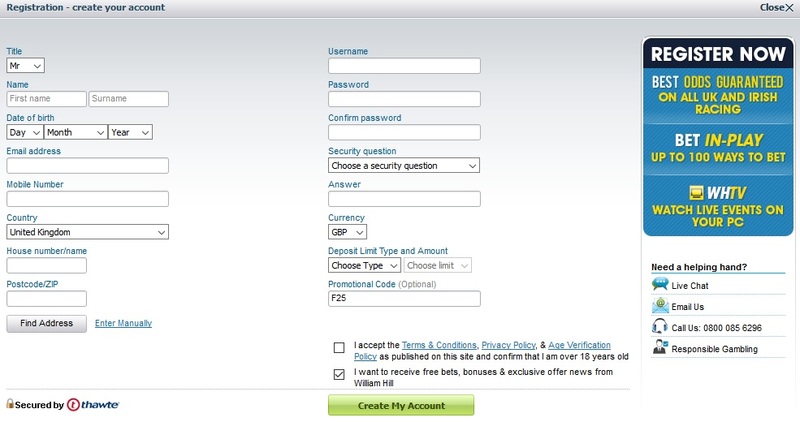 How do you open an account with William Hill? We`ll show you! Now you`re in! Here you have to fill in all the blank spaces with your own personal, accurate details, really easy to complete. You have to check and agree for Terms and Conditions and Age verification policy. Don`t forget to enter your promo code, if not you`ll not be able to get the bonus settled for new customers. Once you finished doing all this, you can go on and click the “Create My Account” tab. The last thing you need to do before starting your betting operations, you need to chose your deposit methods and make a first deposit. Good job!